From left: Dean Gary Pollack, Chris Szlenk, James Robbers, Ruby Siegal. Chris and Ruby are recipients of the Robbers scholarship this year. During pharmacy school James Robbers worked as an assistant in the research lab of Professor Melvin R. Gibson at WSU. “I will always be grateful for Dr. Gibson’s generosity in mentoring me because it started me on a pathway toward a career in research and academics,” Robbers said. Robbers, of Mukilteo, Washington, was named the 2017 Outstanding Alumnus of the Year by the WSU College of Pharmacy and Pharmaceutical Sciences (CPPS) on Friday, September 28. He was selected for his continued contributions to the pharmaceutical sciences at WSU that provide graduate students travel awards, fellowships, and research grants, as well as summer research internships for student pharmacists. 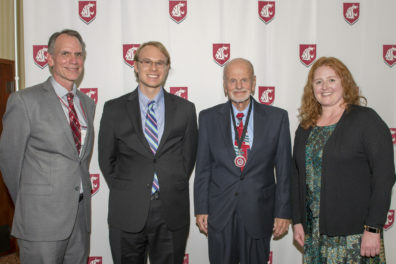 Robbers was recognized at the college’s annual Crimson Gala in Spokane, Washington. The Outstanding Alumni award was established in 1991 by the CPPS dean’s advisory council to recognize a pharmacy alum whose personal achievement or contributions to the community, society at large, or the health care profession have brought distinction to his or herself and the college. Robbers not only has a legacy in the pharmaceutical sciences and teaching, but has made a significant impact on the college’s ability to recruit exemplary students from around the country and across the world to the Pharmaceutical Sciences Graduate Program. The Ph.D. program has increased over the past eight years from nine Ph.D. degree-seeking students in 2010, to 32 now. Robbers graduated with a Bachelor of Pharmacy in 1957 and a Master of Science in pharmacy in 1961 from WSU, followed by a Ph.D. in 1964 from the University of Washington. After two years at the University of Houston, he joined Purdue University and served as a professor in the department of medicinal chemistry until he retired in 1997. He is now professor emeritus of pharmacognosy. In 2004, he was honored with a WSU Alumni Achievement Award for a lifetime of distinguished advancement in the field of pharmacognosy and pharmacobiotechnology as a renowned teacher, scientist and editor; and for providing superb professional leadership as president of the American Society of Pharmacognosy. Robbers and his wife Diann established the James and Diann Robbers Student Research Scholarship in 2007 as a way of honoring Professor Gibson and in appreciation of the outstanding education they received at WSU from dedicated faculty.